This is the second instalment of a four-part series, Unsafe in any County, by Special Project Coordinator Jeremy Dechert. The series focuses on the dangers posed by historic automobiles or automobile components and is inspired by the Museum’s growing database of digitized historical newspapers from across Huron County. These newspapers can be accessed by visiting our website. In our first instalment, we focused on the dangers of the 1953 Buick Roadmaster’s braking system. 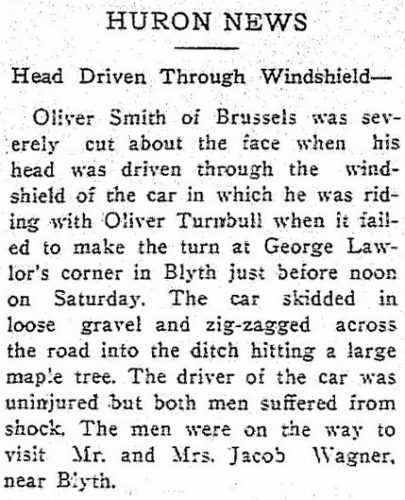 This week, we will be focusing on the dangers and innovations of early automobile windshields. Windshields were first introduced as optional vehicle components in 1904. 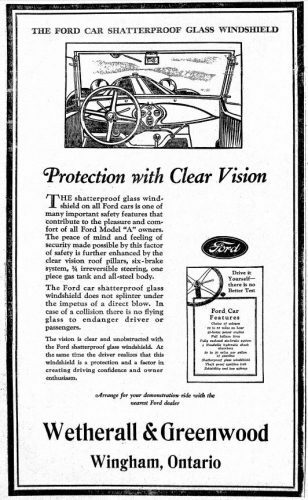 Automobile manufacturers such as Ford and Cadillac offered windshields as standard equipment as early as 1911 while other manufacturers such as Studebaker, EMF, and Flanders offered windshields as optional equipment available at an extra cost. 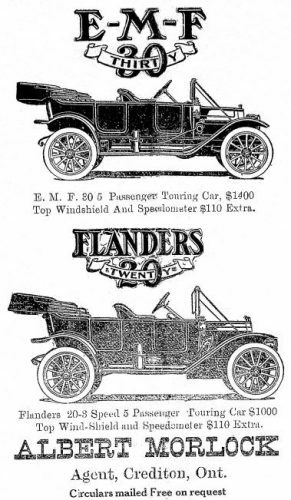 Windshields were not standard features on most vehicles until 1915. Originally, windshields were made with single sheet plate glass. 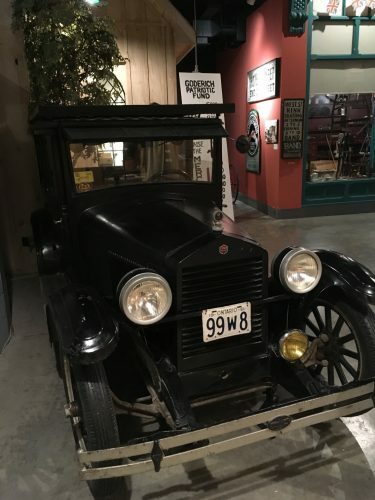 The 1925/1926 Essex Super Six, originally owned by the Museum’s founder Mr. Neil, and on display here at the Huron County Museum, has a windshield made of plate glass. This glass was effective for keeping bugs, debris, water and snow out of a vehicle. However, should an accident occur, it was less successful at keeping the driver or passenger(s) in. They could easily be ejected through the window or the glass could break into large, sharp pieces which were liable to cause injuries. 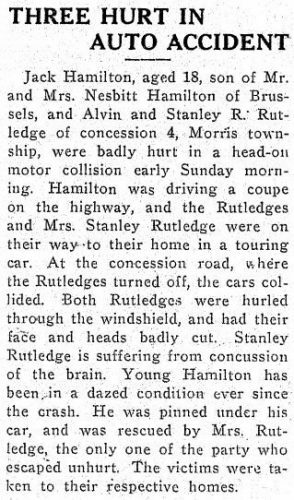 There are numerous accounts of such injuries occurring in Huron County as seen in local newspaper articles. In 1909, there was a major development in glass technology: safety glass. Safety glass does not break as easily as plate glass. It is intended to crack and splinter rather than shatter when impacted. This type of glass helps to prevent occupants from being ejected from the vehicle in the case of a crash, provides more rigidity to the car frame in the case of a rollover, and makes it more difficult for thieves to break into a vehicle. 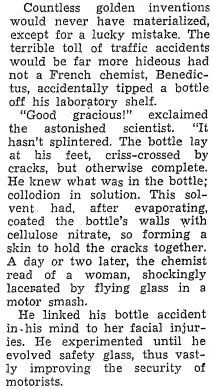 The August 2, 1956 edition of the Zurich Herald included a concise explanation of how safety glass was invented by French Chemist Edouard Benedict…by accident. Although the invention of safety glass undoubtedly saved many drivers and passengers from injury and death, it did not avoid criticism. 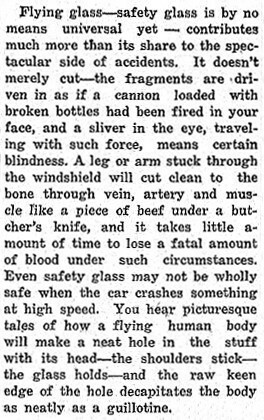 In 1937, The Department of Highways (US) outlined the shortcomings of safety glass in an article titled Automobiles – and Sudden Death. 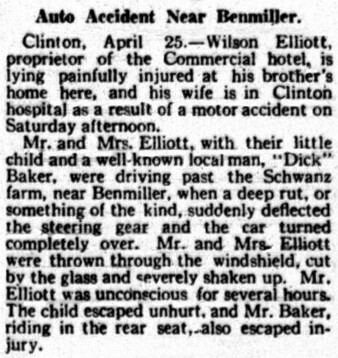 Though sensationalist in tone, the article notes the danger of partial occupant ejection during automobile accidents. According to the article, the safety glass could “guillotine.” Ralph Nader echoed this concern in 1965. He specifically criticized the quality of safety glass. 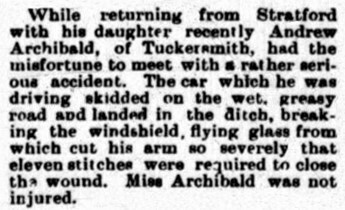 He named safety glass windshields as the third greatest culprit in causing injury during automobile accidents. He argued that while safety glass windshields often prevented an occupant from fully leaving the vehicle, they did not protect occupants who were only partially ejected. The glass would act as a jaw when the occupant’s momentum came back towards the vehicle following the initial impact. Safety glass has progressed immensely since 1965 but this great innovation was not an instant solution to a serious safety issue facing motorists. 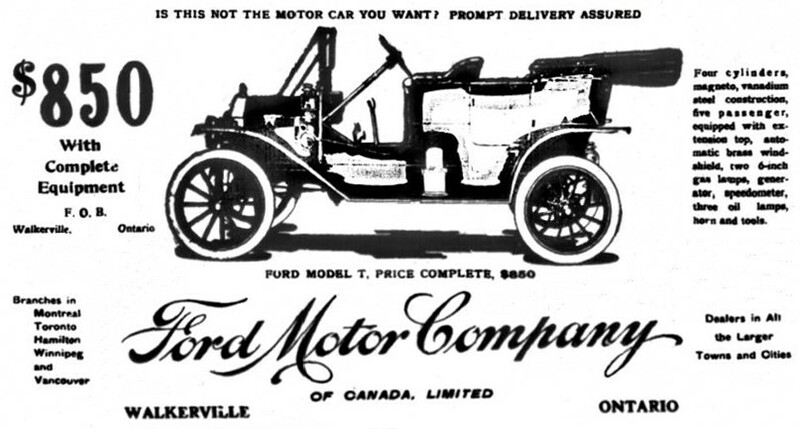 For more automobile history, visit our website and search our growing collection of digitized newspapers from across Huron County.